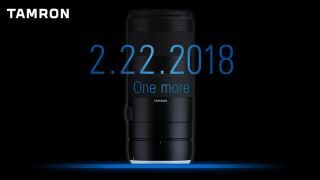 Tamron has spent the last week teasing us on its social media channels with the news of an upcoming optic – and now, it appears that lens will be joined by another. The first teaser (below) was posted on the company's social media channels last week, and was carefully shadowed to only reveal so much. The presence of two barrel rings, however, suggest that we should expect this to be a zoom lens. This has now been followed up by a further image, which shows a noticeably different lens along with the words 'one more'. This lens also shows two barrel rings, and the strongest rumours suggest that this will be a 70-210mm F/4 DI VC USD, whose DI suffix indicates compatibility with full-frame DSLR bodies. As such, we should expect this lens to arrive in Canon and Nikon flavours at the very least. The VC and USD suffixes, meanwhile, respectively indicate the presence of Vibration Compensation and an Ultrasonic Drive motor, both of which we would expect to see in a constant-aperture zoom lens intended for full-frame cameras. As we are now just weeks away from the CP+ show in Japan, the timing of this announcement makes a lot of sense. Naturally, it seems certain that this will be accompanied by further announcements from other corners.